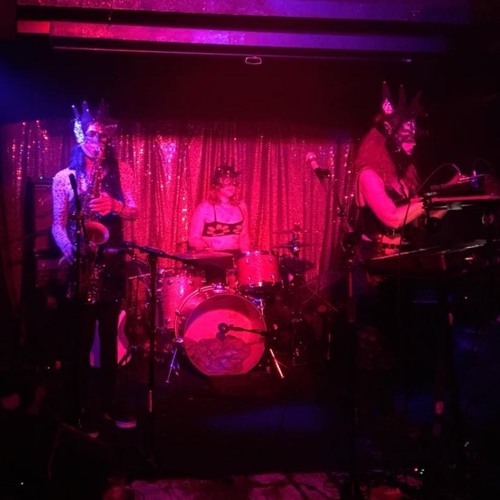 Moira Scar is post-punk freak-deathrock trio of LuLu Gamma Ray (synthesizers, vocals), Aimee S (drums) and Roxy Monoxide (guitar, vocals, sax) from Oakland Ca. founded by Roxy Monoxide and LuLu Gamma Ray in 2009, Moira Scar started as a duo, releasing two albums (Excerpts from the Holy Scumbrella, 2009, self released; Slink To Intensity, 2010, self released) and touring the states multiple times. In 2012 Moira Scar became a trio (Ryan Bonus Beast), releasing Scarred For Life (Resipiscent Records), and touring the states. 2014 brought a different third member (Mikey Mayhem) into the Scar-ship, producing the album Psychoid (Cochan Records) and another national tour. Roxy and LuLu then went into V.E.X. mode, recording three albums as V.E.X. (Voltage Empath Xanaxax, also known as Ventriloquest Ectoplasmold Xanaxax) and touring Europe, Mexico City and parts of the U.S. Now back as Moira Scar, Roxy and LuLu are joined by Aimee, creating a huge lush sound and an epic new album (Wound World Part 1, Near Dark Records) with tours coming, Moira Scar is stirring up their most potent witches cauldron of spells yet.